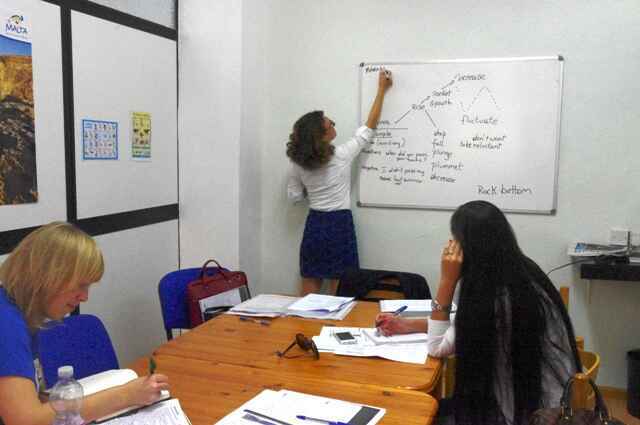 Business English Interview with Victoria, an Elanguest teacher from Malta, will be interesting and useful for both teachers of English and students. Victoria is a true lady. She is a charismatic and gifted person, whose broad experience in teaching business English, modern approach to education and friendliness make foreign students at Elanguest school inspired and enthusiastic about learning the language. Victoria is a worthy teacher to learn from and personally I can’t help but admire her business English skills, professionalism and extraordinary beauty. — Please, tell us a little bit about yourself. — I have been teaching English for a number of years. I’ve been teaching Business English which has been my forte, for, perhaps, 8 years now. I am also an Art Historian and an Art teacher, a teacher of Fine Arts, I’ve taught little children. But my strength has always been with adults, I feel that teaching adults gives me great pleasure, and it has always been, possibly, a strength of mine, — to try to impart my knowledge with others. — Do you remember any particularly impressive moment in your class? — Yes, I think, possibly, when I have meetings and presentations, I feel that students do very well. And sometimes it tends to focus on the realistic where the students get so much involved in what they are doing. They tend to take it to the extreme, perhaps, on an argumentative side. That gives the lesson an element of credibility. — What advice can you give to students who are interested in learning business English? — Well, I think the most important thing is that the students have to come with an element of determination, that they really want to learn English, so there has to be a motivation. They have to come well-prepared with what they want to learn, for example, if I have a student who wants to improve her English skills, then she needs to concentrate mostly on improving her vocab. I tend to learn what my students’ requirements are and then I can focus on work what their requirements are and improve on their skills. I dedicate time to understand these requirements. And this makes a student understand what his weaknesses are and works on them. — Is it difficult to be a Business English teacher rather than a General English teacher? — No. I think business gives me more challenge. Because General English tends to focus more on grammar, while, on the other hand, in business you are learning from your students as much as they are learning from you. So it’s «give and take». They teach you a lot. If I have a law student or a lawyer, or an established manager, you are learning a lot about their company, what they do. And it gives me a lot of good feeling about it, that I am learning, as well. It’s not just me teaching. — What material do you use to teach Business English? — I use a lot of different resources because I don’t like to use the same things. I think that repetition tends to put a person in a little box of mediocrity. So I want to explore beyond that box. I try as much as possible to use different material. Visual resources are a must. In today’s day and age students, especially young students, enjoy visual resources. So I bring my tablet with me and I think that it’s very important. Don’t forget we have to practice the four skills: the listening skills so I use different tapes — students need to listen. And you understand also what their weaknesses are. So it’s not just reading an extract. I use newspapers — newspapers are so important: current events, what’s happening in today’s day and age, the political line, what’s happening in their country, what’s happening in other people’s countries. And people have to bring themselves up-to-date. And I think the importance of using these visual resources … We have such a large choice nowadays: the media, television, Internet — we can use all these assets. And students learn from these, not just books, which I do. — Victoria, what do you think makes Elanguest a special school? — Elanguest has always been one of my favourite schools. I’ve taught in four different schools in Malta. And, perhaps, I have a slightly warm feeling about this place. Maybe because I know the family — it’s a family run business. And it goes a long way. Mr David West has always been a true gentleman and I feel that has made a place more special. He has a wife, Ursula, who has helped to make this place work over the years. In time, I have also had a fortune to meet with his son, Tom, who has taken over now. Tom has done a world of good to this place, and I enjoyed working for this family ten years ago as well as I enjoy working for the school now. I feel that it is a great opportunity for students coming from abroad to study in this school. It is a very friendly environment, it offers very good education programs for students of all ages (all ages — I am speaking about different ages from 18 and over, up to 60-70-80, in fact, I taught students of various ages. But it is a very friendly environment and very professionally run. The Director of Studies, is also a very special person, too, it’s Lara. She has helped to make the place feel very friendly and she organizes the timetable very well, with proficiency and professionalism. And the teachers are all very qualified. 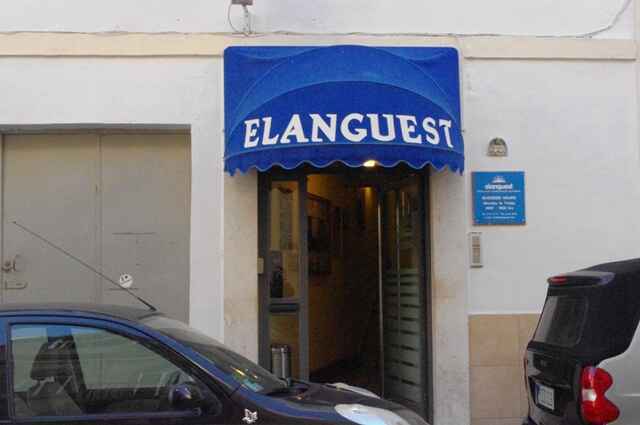 I think every student, who thinks of studying English in Malta, should try Elanguest. Also, another point is that it is situated in the heart of the entertainment area close to all amenities and facilities, to the beach. Malta is the place where there’s the sun and the sea. — Thank you very much! Your lessons are really practical and useful. I admire you as a personality and a talented person. Wish you all the best and thank you for your work. — Thank you, it’s been a pleasure meeting you and I wish you success in your work.